> Today was one of those extremely boring days that we’re going to be seeing a lot of during the offseason once the World Series is over. There was basically no news- at least on the Brewers front. But, scrolling through MLB Trade Rumors earlier and seeing some of the smaller names that are going to be out there this offseason, I figured I’d project how some of them could fit in with the Brewers. I’ll be doing a lot of this over the next few months, but I’m going to start with two random players- a reliever and a shortstop- and discuss how they would fit in with the Brewers, what the odds of the Brewers signing them are, and so on. 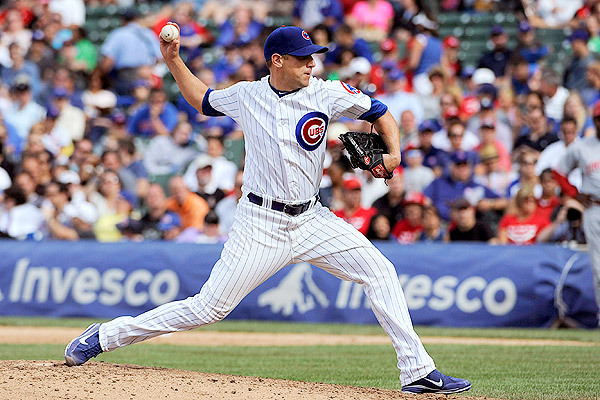 The first name that caught my eye scrolling down MLBTR is reliever Shawn Camp, who spent 2012 with the Cubs. Camp doesn’t come to mind when you think of dominant relievers, but he’s quietly been relatively consistent over the past few years with the Blue Jays (2008-2011) and the Cubs (2012). 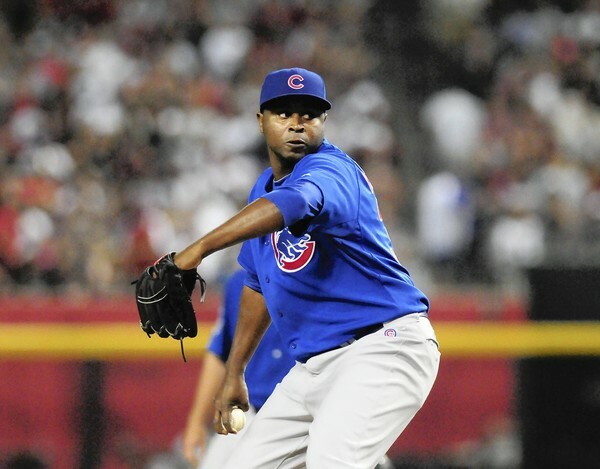 In 2012, he went 3-6 with a 3.59 ERA, and was one of the bright spots of a Cubs bullpen that wasn’t the greatest (though not as much of a train wreck as the Brewers’ ‘pen). He throws in the high-80’s to low-90’s, but has a pretty deceptive 3/4 delivery. I think he’d be a solid fit in what will hopefully be a revamped Brewers bullpen. 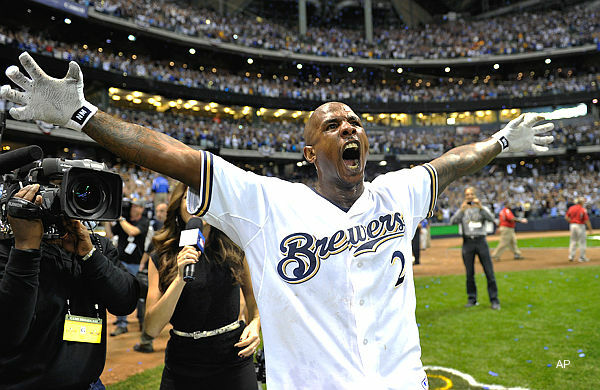 The Cubs have shown interest in bringing him back next year, but, if the Brewers show interest as well, I get the feeling he’d rather come to Milwaukee instead of Chicago. The next guy is shortstop Marco Scutaro- yes, the NLCS MVP for the Giants. I’ve been thinking about him as a possible option for the Brewers since September, but the chances of the Brewers getting him are looking slimmer and slimmer with Scutaro’s unbelievable postseason feats. Anyway, I thought he’d fit in as the starting shortstop if Jean Segura shows that he isn’t quite ready for the starting role. But, even if Segura did earn the starting role, I thought Scutaro would be a better option to sign as a back-up than bringing back Alex Gonzalez in that role. Again, though, Scutaro’s recent success tells me he’ll be looking for something more on the free agent market this offseason. So, unless the Brewers are willing to give him the starting nod at shortstop regardless of the Segura and Gonzalez situations, I’m doubtful of the Brewers’ chances of bringing in Scutaro. > Jonathan Lucroy will not be eligible for Super Two Status. > The Marlins fired Ozzie Guillen after his disastrous first season in Miami. Guillen and Bobby Valentine (Red Sox) held similar circumstances going into this season with their respective teams: each had been given a great team- at least on paper- by their front office, and were expected to contend for a title. I can tell you that I fell for it; I had both the Red Sox and Marlins making the playoffs via the Wild Card prior to the start of the season. But chemistry issues in the clubhouse plagued both teams, hence the early exits of both managers. > Japanese super-prospect Shohei Otani- pretty much this offseason’s Yu Darvish- has decided to pursue an MLB career rather than stay in Japan. Just like last year with Darvish, the Rangers and Red Sox have done the most work with him so far. It’s a long shot, but I think he’d be an interesting option for the Brewers. At first, I thought he wouldn’t make sense for them financially. But, looking at Otani’s situation, it’s unlikely an 18-year old is going to get the money Darvish did last year. Plus, since Otani is just coming out of college and never signed with a Japanese team, the MLB team that signs him won’t have to pay the idiotic posting fee. > Randy Wolf is going to miss all of 2013 due to Tommy John Surgery, a procedure he also had to go through in 2005. That makes me wonder if this had something to do with his sub-par performance with the Brewers in 2012. Blue Jays: Claimed David Herndon off waivers from the Phillies; designated Tyson Brummett for assignment. Phillies: Outrighted Michael Martinez to Triple-A. Angels: Outrighted Jeremy Moore to Triple-A.